The River Lea has been “pushed to its very limits” according to campaigners, after thousands of fish were found dead in the river this week. Large numbers of fish have been found floating lifeless at various points along the river after storms washed road pollution into the waterway. Scores of dead fish were seen to accumulate at Springfield Marina and the Lea Bridge Weir. The Canal and River Trust, the body responsible for keeping the river open to navigation, said that they estimated the number of fish deaths to be in the thousands. Recent warm weather depleted oxygen levels in the river, according to the Trust, with levels reduced further after heavy rainfall washed oil and other road pollution run-off into the river. Run-off from driveways and misconnected drains are also thought to have contributed to the problem. The Trust set up an aerator at Lea Bridge Weir to increase oxygen levels in the water and provide a refuge area for fish. Campaigners have said the design of the drainage system around the river is to blame, with nothing to prevent pollution flowing into the waterway. The Environment Agency (EA) also set up an aerating unit lower down the Lea at Three Mills boatyard. A spokesperson for the EA said “Mechanically aerating the water has helped raise oxygen levels in the river, which crashed as a result of recent thunderstorms. This helped created a refuge area for fish such as bream, perch, pike and roach. Aeration equipment will be kept in as long as needed and until the unsettled weather clears. Robin Grey, a London boater said “Promises were made before the Olympics but things haven’t been done. Maybe too much attention is being paid to the area around the Olympic Park, when the problem is literally upstream. “If this river were in a wealthier part of London, it wouldn’t be in the state it is in”. 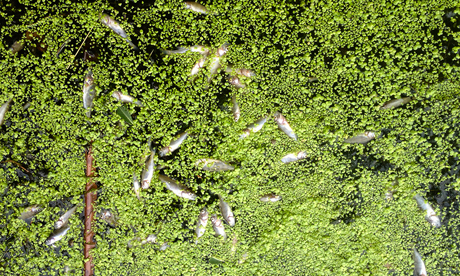 Anyone who spots pollution or dying fish in the river is asked to call the Environment Agency on 0800 80 70 60.